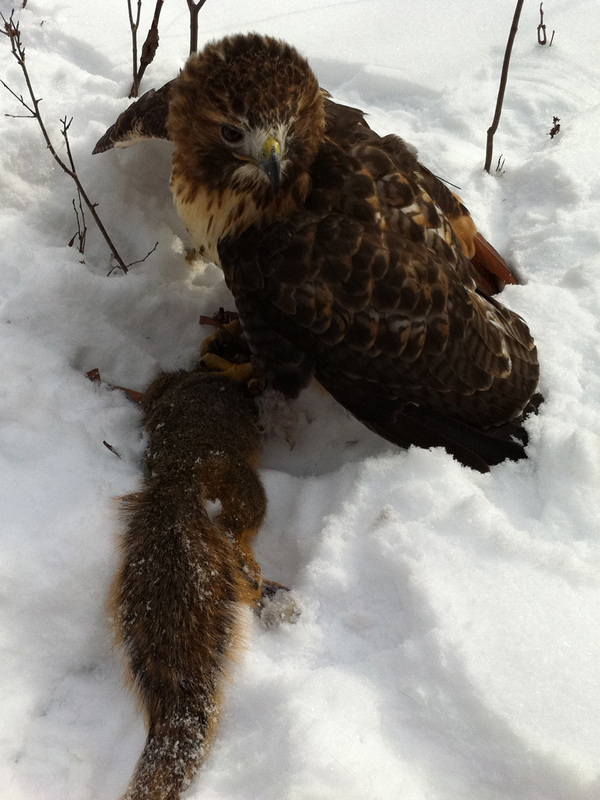 It was nearly 18 months ago when my first hawk trapping adventures were successful and I captured my first red-tailed hawk. 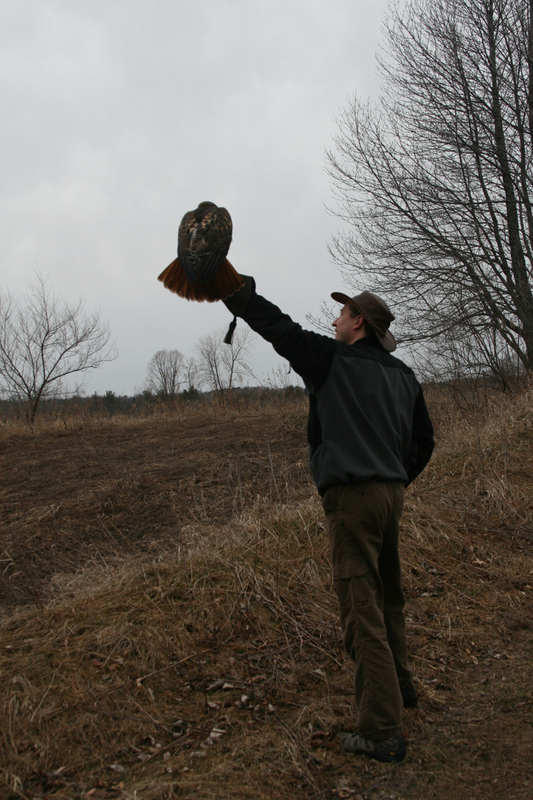 A milestone accomplished in my falconry adventure, but it was really just the beginning. Two successful seasons of training and hunting have culminated into a wonderful falconry experience as I release my first passage bird, Tahoe, back to the wild this weekend. 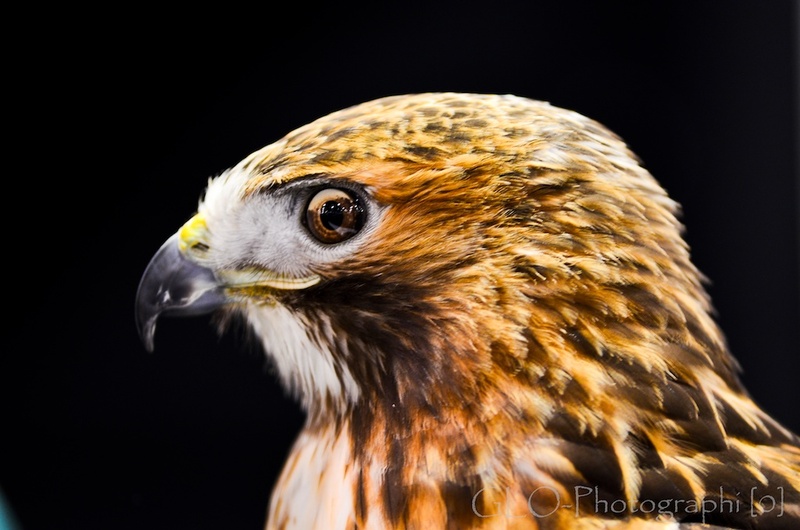 She is a well-manned hawk, has a wonderfully calm personality and adapted to many different falconry situations with ease. She was a wonderful educational ambassador for many of the programs and events that I participated with my sponsor. She received many compliments from fellow falconers on her manning and I was equally pleased with her disposition. Honestly, I cannot take credit for her demeanor, I think I just got lucky to trap such a great bird who manned well and trained quickly. It is with great mixed emotions that I release her back to the wilderness and the life she must lead alone, but I know deep in my heart that this is what must be done. I’ve been preparing for this day since the adventure started. A wild hawk is just that: a wild animal. I borrowed her from the wild for short time to learn from her and participate in her adventures. We trained together in the beginning in order to establish a good working relationship. 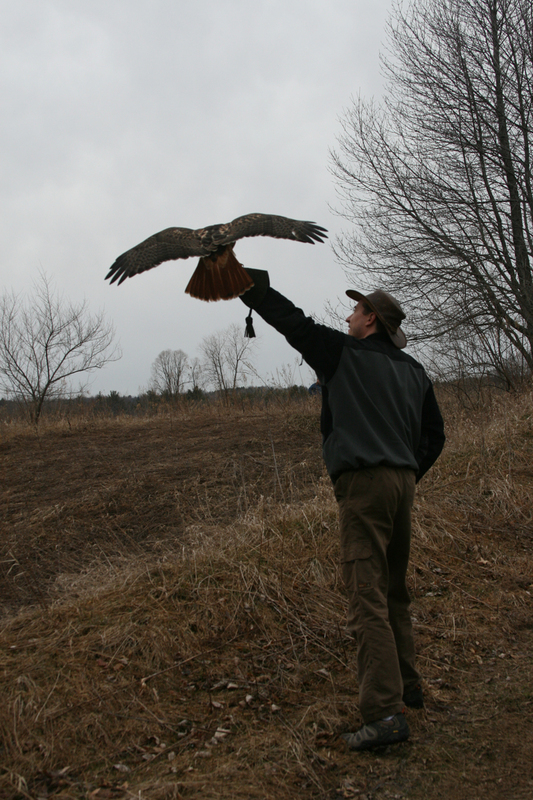 The training experience is all about perspective; if you look at training from the bird’s perspective, then you might say that the hawk allows the falconer to participate. Without this perspective on falconry, one can not truly appreciate the relationship between the falconer and the hawk. 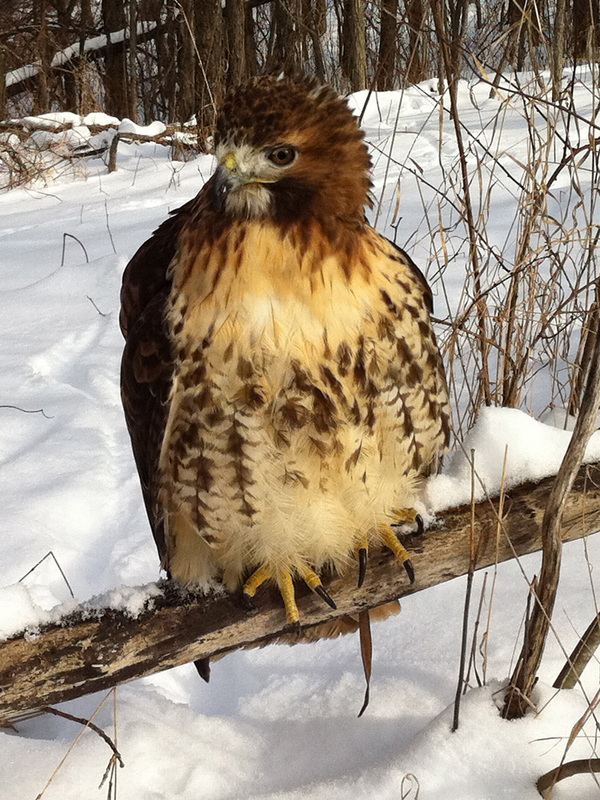 It is for this perspective and appreciation of my wild hawk that I fully intended to release her back to the wild. My deep appreciation for these beautiful animals is what turned my on to falconry in the first place; I have no intention of turning my back on these principles now, even after all of the investment into training. In order to completely honor Tahoe and her purpose in the wild, I must release her back into the wilderness where she belongs. Another aspect of falconry that is a consideration here is my own education. In order to continue to improve my apprenticeship skills, I believe that I continuously need to improve upon the skills that make a good falconer. I cannot refine my manning and training practices with the same bird. I need another training opportunity in order to continue growing as a falconer. Yet another reason for releasing Tahoe this year and planning for another bird next fall. I spent two weeks after her last hunt fattening her up with good portions of rich nourishment each day so that she had a good start on her re-introduction into the wild. During this two weeks, I weighed her once and left her alone in the mews to settle down from human interaction. When I took this approach last spring, it took her five days to react to me like a freshly trapped red-tail. She bounced around the mews and wasn’t interested in coming to the glove at all. This year, she has fattened up nicely and is ready for release. I went out to the mews to get her and she bounded up to my glove without any hesitation. I took her out to the truck, opened up the giant hood, and she bounced right in. We drove out to a field where we took a few pictures and released her. She took a few seconds to gather herself, standing on the fist, and then leapt into the air. It was a bittersweet moment for sure, but one that I’m proud of and I’ll treasure our days hunting for many years to come. After we released Tahoe, we watched her for a few minutes adjust to her new perch. It was in this moment that I said my farewell to my wonderful hunting partner for the last two winters. So the falconry journey closes one chapter today and continues on to another. What will the future hold? What kind of bird will I have next time? 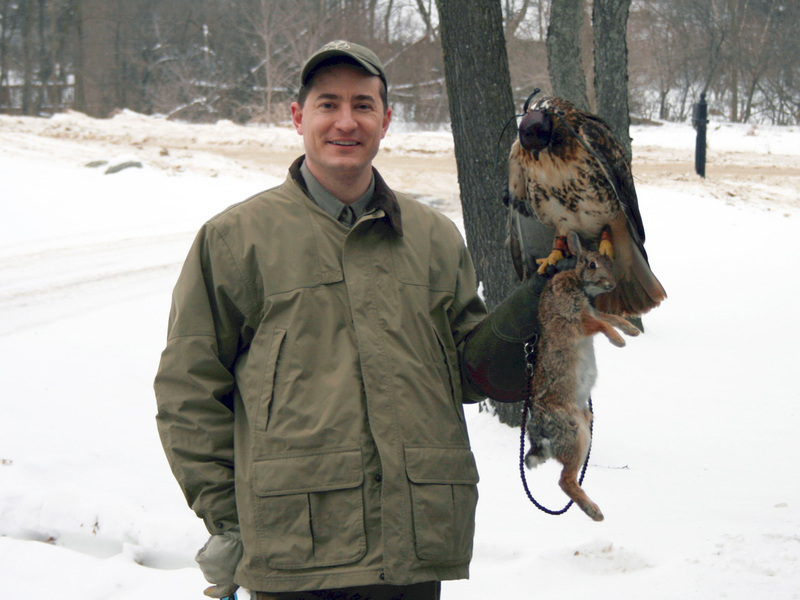 I plan on trapping another red-tailed hawk in the fall and begin the manning process and training program as soon as progress allows. This will further develop my training techniques and falconry education so that I can gain more experience with red-tails that continues my falconry experience for next time. ** Photo credits go to my lovely wife, who was supportive and helpful throughout these past few years of my apprenticeship. Her support of me and falconry means the world to me. Thank you sweetie! It was a chilly first day of spring, but it was at least dry enough to get out one last time with Tahoe for a good hunt. It was only fitting that my sponsor offered to come with, as we walked through a nice section of woods early on Sunday morning. 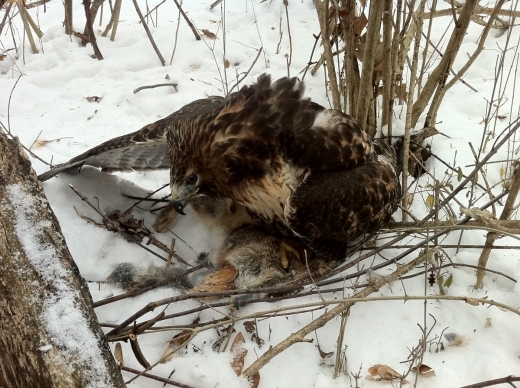 The spring brings with it the end of bunny hunting and the warmer weather and winds make for difficult flights, especially with the tendency for Red-Tails to soar with the warmer air currents. While the day did not include warm updrafts for soaring, the winds were no less subdued for a brisk spring day. So I coaxed Tahoe out of her box and turned her telemetry on for one final morning of hunting. We started out our usual circle looking in some tall brush for bunnies, but the brush only yielded a handful of golf balls, apparently from someone’s summer round of practice. Tahoe found a comfortable perch and continued looking down at the grass. With the warmer weather, the mice and voles were plenty active today, and Tahoe didn’t mind watching for a quick tasty snack. Two stoops later, I had to walk Tahoe over to another set of trees and let her up to watch for larger quarry. Her first follow up showed some decent interest, and a few moments later, was diving down into the woods after something small. I watched her teardrop out of the tree, down into a bundle of sticks, and she proceeded to walk quickly along the length of a log, grasping after something small. The chipmunk was in quite a hurry to get away from Tahoe, and Tahoe gave a good chase and wouldn’t let up. A few moments later, the exercise repeated itself, only with a large vole as the quarry. I finally got Tahoe away from the smaller animals and perched her high up. She followed along very well, and went up ahead a few trees. I flushed a rabbit, directly towards her and she stooped into the brush to catch it. She juked to the right at the end of her stoop at the same time the rabbit dodged to the left and the bunny was gone into the high grass. A good effort and some good practice. I was pleased with her performance, even if she was not terribly responsive. Our brush beating efforts were fruitless the remainder of our walk back to the car, and we decided to try another hunting area. A short drive from the park, we went further south to a great spot with plenty of game. I withdrew Tahoe from the giant hood in a good stiff wind, and we walked into the tall grass, towards the trees to get a good perch. Tahoe took the low perch, and sat on top of a log pile for the first few minutes to get her bearings. In less than the time that it took for her to settle in, a rabbit jumped out of the brush pile she was sitting on. She turned, made s light move towards it, but decided that the bunny had gotten the better of her, and it ran off behind her. This new area was full of game. In another 30 minutes, we flushed three more rabbits and three woodcock out of the brush, all without a decent chase from Tahoe. In her last high perch, she watched the ground very intently and dove out of the tree, into the tall grass and came up with a medium sized vole. Snack Time! Tahoe wolfed down her prey quickly and promptly rewarded her with a quick tid-bit from the glove. While it was not the ending that I had hoped for, it was a good morning getting Tahoe a few good chases and a successful meal to end her hunt. 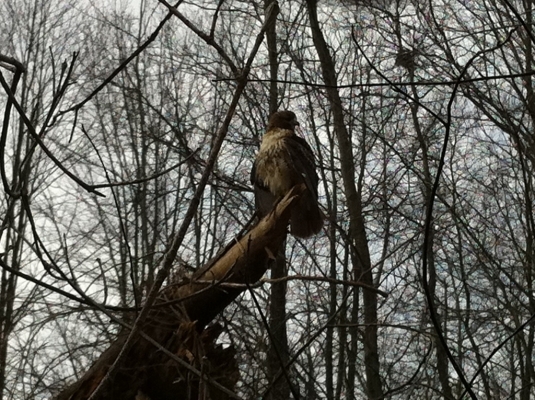 I called her out of her last perch with the lure and she quickly returned for our walk back to the car. With the hunting season over, and the warmer weather approaching, we have hung up the falconry gauntlet for the season and we are now preparing to release Tahoe back to the wild after two hunting seasons together. I am satisfied with our time together and I look forward to returning her to her habitat and her true home out in the wilderness. This weekend has been quite eventful for my falconry activities. First, on Friday was OutDooRama. Michigan OutDooRama is a sportsmans expo with all kinds of displays, booths, and equipment for the Michigan Hunter. 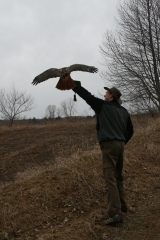 The Michigan Hawking Club has a booth every year to promote falconry and educate the public about our raptors. I spent Friday afternoon at the show, with Tahoe, talking to folks about our club, how we care for birds and a little about hunting with my Red-Tail. Saturday Morning, I went out to a local hunting spot with Tahoe and we got two slips at a bunny rabbit right off the start of hunting. The rest of the morning we were unsuccessful at finding that rabbit again, and didn’t see any additional game. It was nice to get out and the weather shows signs of getting slightly warmer. Heck, after hunting in sub-25 degree winter weather since December, these days when it gets about 34 degrees are just a treat! Sunday afternoon provided another hunting opportunity for Tahoe as we went over to a close spot to get in a quick hunt. I got her out of the box and she took to a tree right off the glove. She bounced around a few perches and then settled in. I was walking a ways away, calling for her to follow along. After a few minutes, I couldn’t see her any more. I attempted to wait her out like I usually do, but she wasn’t coming along. I spent the next twenty minutes looking for her with telemetry and finally spotted her deep in the middle of some cat-tails. Apparently, she had hidden herself so she could eat her meal that she caught. She came up to my glove without hesitation, but she was lumbering along a little slow, she barely made it up to my glove. Her crop was full and all that remained were a few feathers on the ground with a few blood spots dotting the snow. I totally didn’t get to see her catch her meal, and I totally missed her eating it as well. It wasn’t a spectacular hunt, but at least she was successful and got to eat a good meal. It was successful for Tahoe today! I got out to the field on Monday for a Hunt at one of my usual rabbit areas. I checked out several large clumps of brush and broken trees that usually hold bunnies and there was plenty of sign around. I knew that rabbits were close, if not out in the open but I never saw them. Tahoe took a new perch every couple of minutes, matching my pace through the woods. She was doing really well! On a flight to a new perch, her flight stuttered a bit, she continued, and then did a spectacular wing-over and pitched straight down to the ground. Upon catching up to her, she had no doubt stooped on a rabbit hiding in the underbrush. Alas, she had not nailed her quarry, or else I would have heard bells, rabbit cry, and some rustling, but I heard nothing. I made my way quite far from where I had seen her make her dive and looked hard, waiting for the bells to target my vision. 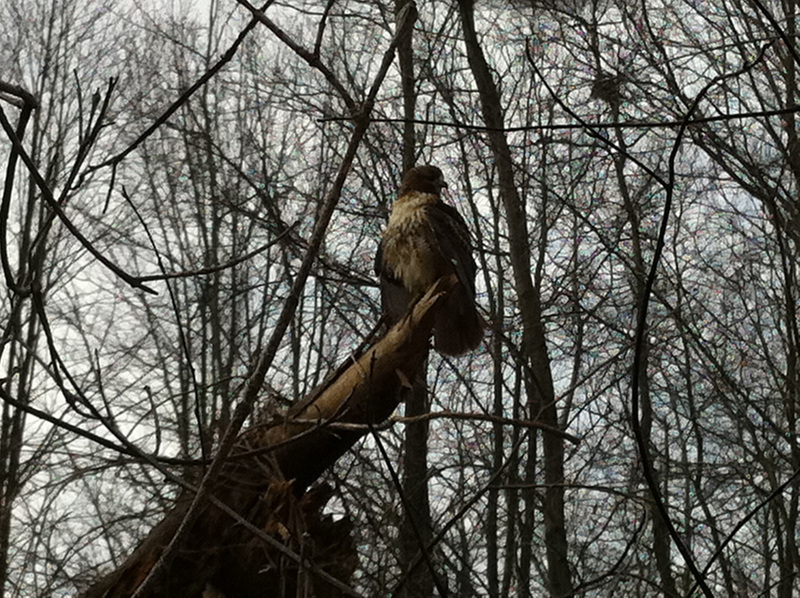 I found her perched low in a branch, sitting quite comfortably and snapped the photo below. The snow made for a pretty background, and it seemed like a telling moment for her. Towards the back of the larger field area that I regularly walk, the forest changes into tall oak trees with the canopy much higher than the typical scrub-brush that populates the open meadow area. The oak trees also hold a decent population of squirrels in this area, although I rarely see them when walking this section of the park. Tahoe took flight and flew out ahead of me and then took a left. She was quite high up in the trees, and sat for a moment. I decided that I was following her, and made my way over towards her when she suddenly bailed from her perch, angled towards the base of a large tree, and then made a hard curve around the base of the tree. She was slightly hidden from my sight until I got around the tree to see that she had a fighting squirrel in her grasp! I hurried and made in with a glove and grabbed the growling squirrel to prevent injury. I became more worried when I noticed that Tahoe did not have a good head-hold, and the squirrel’s head was buried in feathers, still growling fiercely. I assumed the worst and dispatched the squirrel quickly. I later had to remove a mouthful of feathers from the little rodent who appeared to have a hold of Tahoe’s leg when I approached. I quickly made the trade for the lure and walked back to the truck, expecting to have to open my medical kit and perform some emergency first-aid. Once cast, I dug through feathers and was surprised that there was no blood. No injury, no tender spots, no bleeding. I was VERY relieved at Tahoe’s condition and placed her gently back in her giant hood. A satisfying end to a successful hunt with Tahoe’s first squirrel in the bag! adventure, we went hunting through a patch of Christmas Trees. were plentiful in the trees, but they just weren’t out frolicking. that makes for a satisfying afternoon.